Israeli soldiers detained, Thursday, a young Palestinian man, and an issued order preventing him from entering the Al-Aqsa Mosque compound, in occupied Jerusalem, for two weeks, the Wadi Hilweh Information Center In Silwan (Silwanic) has reported. The Palestinian, identified as Bahjat ar-Razem, from Jerusalem, was taken prisoner by the soldiers, who took him to a military base, and handed them the order, before releasing him a few hours later. 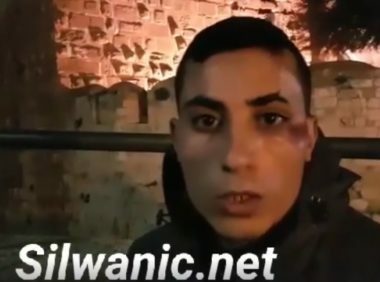 It is worth mentioning that, two days ago, the soldiers detained and repeatedly assaulted the young man, causing various lacerations and bruises, after stopping him at Bab ar-Rahma gate, in al-Aqsa. He was one of many Palestinians who were attacked by the soldiers, and many of them were also taken prison. It is worth mentioning that the soldiers abducted, overnight until morning hours Thursday, twenty-one Palestinians from their homes, in several parts of the occupied West Bank. In related news, dozens of illegal colonialist settlers and officers invaded, Thursday, the courtyards of the Al-Aqsa Mosque and conducted provocative tours after preventing the Palestinians from entering the holy site’s compound. Furthermore, several colonialist settlers invaded the villages of al-Janiya and Ras Karkar, west of the central West Bank city of Ramallah, punctured tires of few cars and wrote racist graffiti. On Thursday morning, the soldiers injured thirty Palestinians schoolchildren, including one who suffered a serious injury, after a group of soldiers and colonialist settlers attacked them, in Hebron, in southern West Bank.